Quick overview Covers the social, religious and political background which led to the formation of the Sikh faith in the fifteenth century. Basing his account on original documents in Persian, Gurmukhi and English, the author traces the growth of Sikhism and tells of the compilation of its sacred scriptures in the Granth Sahib. 'the indispensable reference point for...an historical and sociological understanding of the Sikh tradition...these volumes are a tribute to [the] capacity for both a sympathetic and a balanced rendition of Sikh history.' 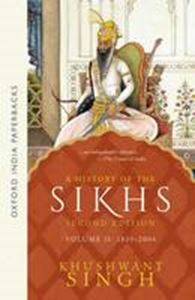 -Times of India 'Singh has done a good job of turning dry history into informed reading.' - Sunday Mail A History of the Sikhs First published in 1963, this remains the most comprehensive and authoritative book on the Sikhs. The new edition updated to the present recounts the return of the community to the mainstream of national life. Written in Khushwant Singh's trademark style to be accessible to a general, non-scholarly audience, the book is based on scholarly archival research. Volume 1: 1469-1839: This volume covers the social, religious and political background which led to the formation of the Sikh faith in the fifteenth century. Basing his account on original documents in Persian, Gurmukhi and English, the author trac es the growth of Sikhism and tells of the compilation of its sacred scriptures in the Granth Sahib. The transformation of the Sikhs from a pacifist sect to a militant group called the Khasla led by Guru Gobind Singh is portrayed in detail, as is the relationship of the Sikhs with the Mughals and the Afghans, until the consolidation of Sikh power under Maharaja Ranjit Singh.